Grown for their colorful foliage, which is usually at its best in the winter, nandinas are also valued for their durability and easy care. There’s no need to wait for ‘Obsession’ which displays its gorgeous merlot to bright red leaves from the beginning of spring and retains the color well into the summer months when the leave mature to green. A selection of a familiar cultivar ‘Gulf Stream,’ this improved variety has a more compact, dense growth. 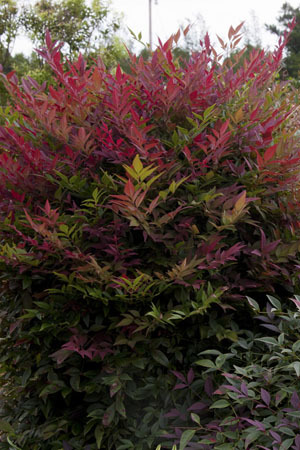 Happiest and most colorful in full to part sun, Nandina Obsession will also tolerate lower-light situations. You may sacrifice some of the brightest colors in shadier locations, however. Adapting to a wide range of soil conditions, these low maintenance shrubs have very few pest or disease problems and are drought tolerant once established. With their year round color and useful size, they make wonderful foundation plantings, either as an accent to break up groups of plain green plants or as a hedge all on their own. An excellent low foundation shrub near windows. The beautiful foliage can be used all year in cut flower arrangements.